I wish I could start this post by saying I recently had a beer with THE "Karate Kid" (not that new one but the original). Even though we're not talking about an 80's classic - hopefully for all ladies and at least a few of you guys, this will be an informative read about a great business in Seattle, that offers a weekly Happy Hour. This short story is about putting wax on - taking it off, breathing in - breathing out (just like in the movie) and throwing back a little something to help relax the pain away. 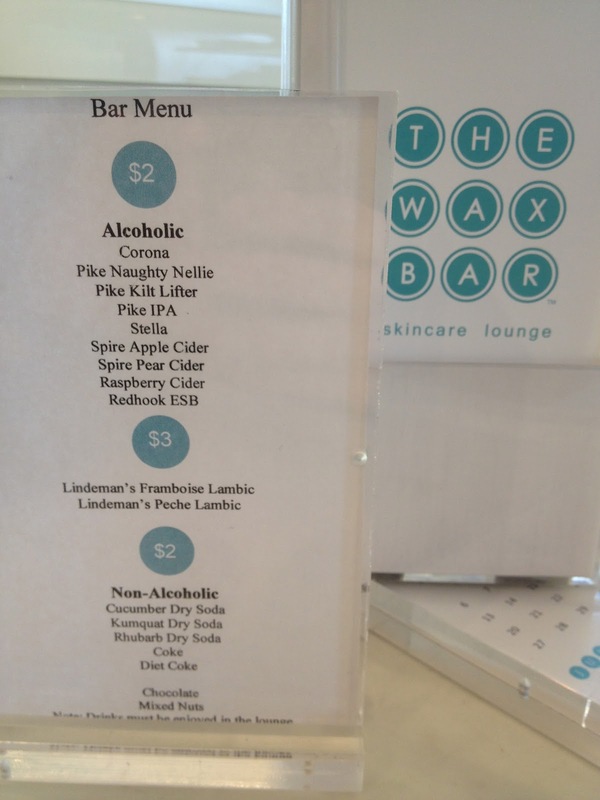 I visited my friends at The Wax Bar last week. The locally owned business has a skincare lounge in Ballard on 15th Avenue NW just south of 60th as well as a location in West Seattle right over the bridge on 37th Avenue SW. The best thing? They're the only spa in Washington with a liquor license! Show up to your appointment a bit early and order a bottle of beer or glass of lambic to make the "wax off" part of your visit a little easier (they always have the latest gossip magazines on hand too). In addition to being able to relax with a drink before your service I've found this skincare lounge to be top notch. I tend to procrastinate making appointments so I've seen nearly a half dozen of the estheticians that often split their time between the two locations. For example: there's Karen, the owner who takes the pain out of the "wax off" process - Michelle, who makes you feel like you have a new best friend just minutes after getting on her table - and Kate, who has some fantastic stories about life adventures here in Seattle and around the world. If you're looking for a new spa or a place to spend an afternoon with a girlfriend why not check out The Wax Bar. The offer a full bar of waxing options as well as sugaring and skincare packages. Its Happy Hour menu is offered from 1-3 during the week giving you a lower price on brow waxing and one other wax service (it's always a Brazilian in West Seattle, it rotates each month in Ballard). Call to make an appointment in advance or do it like I do and call last minute with your fingers crossed hoping they can fit you in (they often do). Tell them WestToast sent you, they won't give you a discount but it might get them to read our blog. When you're there just remember what Mr. Miagi says, "Wax on, right hand. Wax off, left hand. Wax on, wax off. Breathe in through nose, out the mouth. Wax on, wax off. Don't forget to breathe, very important." Which hand they use to wax on and wax off might not matter much - but let me tell you, a beer and that breathing will. No matter what, the ladies at The Wax Bar are true professionals who help make it quick and as pain free as possible to get you ready for summer.